When someone as huge as Steve Jobs dies while still in his prime, it gives us pause in who was the man behind the accomplishments, behind the inventions. Steve has been compared to Edison and Einstein as the inventor of the 21st Century. We often don’t know the real story of Thomas and Albert, except what they tell us in history books. However with Jobs, with his life on the web, we have the great opportunity to uncover what made him a revolutionary, a game changer in the world of technology. This man was truly a visionary in every sense of the word. He had many practices in his daily life that made him remarkable. He shared a few in his famous 2005 commencement speech at Stanford University. If you haven’t seen the video, it’s definitely worth a look. Apple coined the term “Think Different” when he came out with the first iMac in 1998. He put iconic courageous people, like Albert Einstein and Mahatma Gandhi, to remind us that being a risk taker pays off. It also definitely paid off for Apple too in revolutionizing the personal computer. Taking Risks is an essential part of being a success, not just in business, but in life. It isn’t easy to be a risk taker, putting yourself out there for scrutiny and criticism. It takes determination, a confidence in yourself, so that others won’t sway you from taking action. There are some people who just don’t care what others think. I so admire those people because it is human to be concerned about others’ opinions. The key is finding others who will support you no matter what, those who encourage you taking risks and achieving big dreams. I know the times when I risked big, like moving to NYC with no job, had the biggest payoffs, knowing that I had the support of family and friends. Where are you taking risks? Where could you step up be a greater risk taker? Who can you have on your support team to cheer you on in your risks? 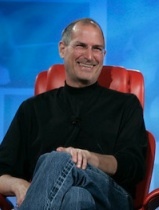 Jobs and his company Apple are such great examples of resilience. In 1985, Jobs was fired from Apple, the company he started, but that didn’t stop him from creating what he loved. “I didn’t see it then, but it turned out that getting fired from Apple was the best thing that could have ever happened to me.” He joined 2 startup companies, including Pixar, where he revolutionized computer-generated animation with Toy Story. He was later brought back to Apple in 1998 when the company had lost its vision and couldn’t compete against Microsoft and Dell. Yet Jobs didn’t lose hope. He soon produced the iMac, and Apple became the comeback kid. Now Apple is the trendsetter, making anything they put out – GOLD! In life, you are going to have setbacks, blocks and utter failures. The setbacks exist to test you and encourage you to grow bigger, stronger, so that you can face even bigger challenges that will most definitely come your way. While it’s much easier to just give up, life isn’t as fun or fulfilling that way. You can’t have the life you want without going after it. Go out there and demand the life you deserve and be unstoppable in getting it. Where are you not going after what you want? Where have you settled? Where you could show more resilience? What steps could you take now to achieve your goals and dreams? “Don’t let the noise of others’ opinions drown out your own inner voice. And most important, have the courage to follow your heart and intuition.” Steve Jobs followed his heart in almost everything he did, even if it was unpopular because he had a vision and wouldn’t let anyone or anything get in the way of that vision. He became unstoppable in creating what he knew to be the best product. He didn’t let naysayers stop him. He stayed true to himself, his vision and his heart. Staying true to yourself is critical to living a life of success. So much of our lives is filled with input from others, that we often forget to listen to our own inner voice. What is it that you want? Remember to listen to your inner voice and act from there. It’s YOUR life, so make sure it’s YOU living it. Where do you stay true to yourself? Your vision? Do you let naysayers or circumstances get in the way of your vision of what you want to create in the world? Where can you choose to follow your heart?